Former England head coach Anna Stembridge will lead Team Bath for the 2016 Superleague campaign. Stembridge, formally Mayes, was dismissed by England in March after four years in the role and replaced by Tracey Neville. 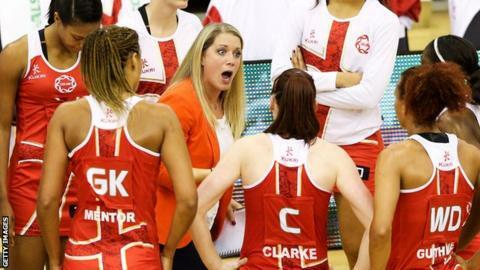 She will now return to Bath, where she used to play alongside Jess Thirlby, who will switch from head coach to director of netball. "I am ecstatic to welcome Anna back to Team Bath," said Thirlby. "While I've coached with Anna before and we have both coached internationally at every level, this is not a case of looking back. "We are moving into a new era as a sport and as a franchise and with all of the knowledge that we have accumulated globally we can make a big leap forward." Team Bath have won the English domestic league title five times but failed to qualify for the play-offs last season after finishing fifth. Under Stembridge, England secured a historic series whitewash against world number one Australia in 2013, but she was dismissed earlier this year after the team failed to win a medal at the 2014 Commonwealth Games in Glasgow.